All right. The Justice Department has brought many cases against suspected Chinese hackers by now. They're accused of stealing American companies' intellectual property and trade secrets. But cyber theft, by all accounts, continues at a rapid pace. So is the Justice Department's strategy working? Here's NPR justice reporter Ryan Lucas. RYAN LUCAS, BYLINE: May of 2014 and front-page news out of the Justice Department. UNIDENTIFIED REPORTER: The United States has charged China's military with cyber espionage. Five Chinese officers are accused of hacking into big American companies for their trade secrets. LUCAS: It was a big deal because it was the first time the U.S. had charged state-sponsored actors for hacking American companies. Now, fast-forward to this past December. 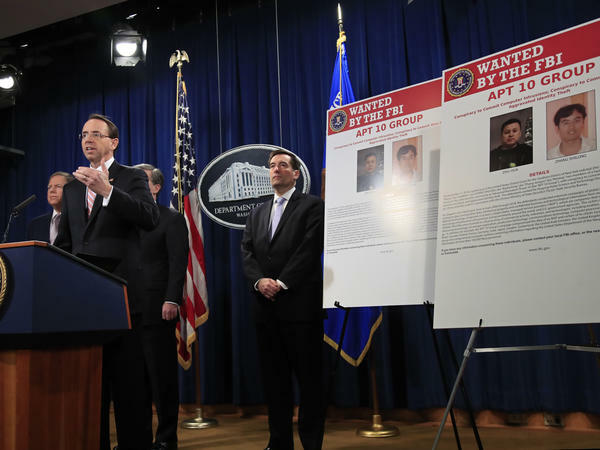 Here's President Trump's deputy attorney general, Rod Rosenstein, announcing new charges against two more suspected Chinese hackers. ROD ROSENSTEIN: America and its many allies know what China is doing. We know why they're doing it. And in some cases, we even know exactly who is sitting at the keyboard perpetrating these crimes. LUCAS: It is a scene that has played out repeatedly over the past five years. The Justice Department has announced charges against suspected hackers allegedly working at the behest of the Chinese government to steal American intellectual property. Despite the slew of indictments, officials say China has not stopped targeting American companies. And in nearly all of the hacking cases, the accused are in China and unlikely to ever see the inside of a U.S. courtroom. That has led some observers to question just how effective this indictment strategy is. ADAM SEGAL: It does not seem to have stopped the Chinese, and it certainly doesn't seem to have imposed any cost on them to get them to the point where they think it's not worth the attacks. LUCAS: That's Adam Segal. He directs the Digital and Cyberspace Policy Program at the Council on Foreign Relations. Segal is not alone in his criticism. Jack Goldsmith is a Harvard law professor and former DOJ official in the George W. Bush administration. Goldsmith argues that because indictments do not pose much of a cost, they have failed to deter China from further hacking. The charges may embarrass the defendants and show that the U.S. can pinpoint who's behind the hacking, Goldsmith says. But those costs are paltry compared to the billions of dollars' worth of secrets the Chinese are allegedly stealing. 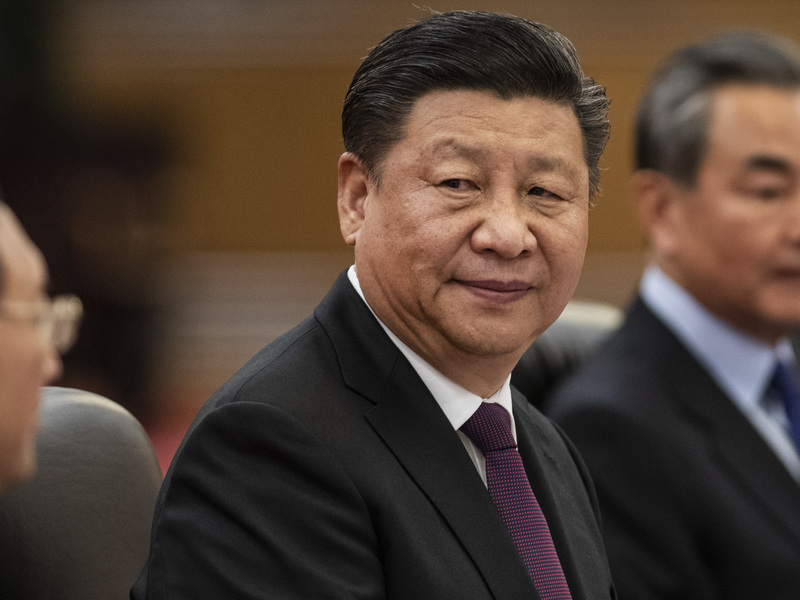 JACK LANDMAN GOLDSMITH: I would say that, to date, the United States has not found a strategy - over many, many years after much discussion and much thought and much effort, it has not found a strategy to get the Chinese to tamp this down. LUCAS: Supporters acknowledge that China has not stopped hacking, but they say indictments have had a positive effect. They note that a year after the DOJ first brought charges, China reached an agreement with the Obama administration to not conduct cyber economic espionage. Officials and cybersecurity experts say the pace and scale of Chinese cyberattacks dropped off after the agreement. The hacking has ramped back up since then, according to U.S. officials. Although some of the current hacking may fall into a gray zone that is arguably not covered by the 2015 deal. The indictments also have been critical in publicizing information that previously had been kept under lock and key by the U.S. government. That has helped raise public awareness, particularly among American companies, about China's pervasive hacking. JOHN HULTQUIST: What the indictments do is they put all this information about this in the hands of the people who are now being targeted. LUCAS: That's John Hultquist. He's the director of intelligence analysis at the cybersecurity firm FireEye. HULTQUIST: So it's really important to get this into their hands and in some cases even prove to them that it's happening. LUCAS: That information has prompted some American and other Western companies to reconsider doing business in China or with Chinese partners. Hultquist says the indictments also have had a disruptive effect. HULTQUIST: The adversary seems to have, at least for a short term, changed up operations, burned their infrastructure, had to change their tooling, go back to square one. LUCAS: John Carlin led the Justice Department's National Security Division in the Obama administration. His new book, "Dawn Of The Code War," details how the DOJ built its first case against Chinese hackers back in 2014. He says indictments should not be viewed as a solution on their own. Instead, he says, they send a public signal while at the same time laying the groundwork for the U.S. to use other tools to get China to stop. JOHN CARLIN: But if we're going to change this behavior, it has to be part of a larger strategy of raising the cost and includes all the instruments of U.S. power, including the power to sanction under the Treasury Department. LUCAS: To date, the U.S. Treasury has not used that power against China over its cyber industrial espionage. Ryan Lucas, NPR News, Washington. (SOUNDBITE OF PLAID'S "SLAM") Transcript provided by NPR, Copyright NPR.